OBTAINABLE WISDOM  DISCOVERING HEAVEN'S ANSWER is the companion book to pastor and author Ben F. Gray's recent and internationally acclaimed book: Heaven's Answer to Earth's Dilemma  A Grace Revolution. OBTAINABLE WISDOM is an excellent reader's study guide for both individuals and groups. Ideal for anyone wanting to dig further into the challenging and prophetic material presented in Heaven's Answer. - To consider ways in which people can be trained, equipped and released into their God-given individual vocation and calling. This reader's study guide is primed for a grace revolution and is a key ingredient to seeing the people of God become the 'salt, leaven and light' of society and creation. It will become an indispensable aid for equipping and releasing them into their divine calling. Obtainable Wisdom is not for the faint hearted. It contains a clear outline of practical theology that brings Biblical principles to life which, if followed and implemented, will result in attainable and lasting transformation in all levels of life today. This book is an invaluable asset to every believer who knows that the church must change if we are to be genuinely faithful to our Lord's command and responsive to His mercy and love. 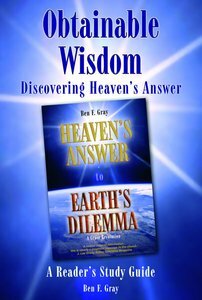 Obtainable Wisdom has been carefully created to complement the author's fine work, Heaven's Answer to Earth's Dilemma immensely helpful and extremely usable. Wonderfully done, Ben! ^Obtainable Wisdom is a redemptive book! It will take you places you've probably never been before and ask you questions you've probably never thought of asking. An excellent reader's study guide. Obtainable Wisdom bridges brilliantly the usual gap between head knowledge and heart knowledge. An outstanding book designed for individual as well as group study. About "Obtainable Wisdom - Discovering Heaven's Answer (Study Guide)"
Ben Gray is the founding Pastor of CityHarvest Church Brisbane; Apostolic Leader of CityHarvest International; Chairman - citywide association of churches and Christian ministries; Founder and Apostolic oversight of the Australian Prayer Network. He is also the author of Heaven's Answer to Earth's Dilemma and Obtainable Wisdom.